Fig. 1 is the same as the previous stage, it shows 4 routes that you’ve discovered and confirmed with the council as to it’s status (Open to Motor Vehicles or not) but can your Duster cope on them? This is the next thing, you can look at YouTube videos and try to determine if they are easy or not but things can change seasonally with routes the best way is to go drive it or check Trailwise (from the Green Lane association) to see if anyone has driven it recently and reported any issues back although your GLASS rep can assist to some degree but he may not be aware of your Dusters capabilities and your driving skills so then you have to go to the lanes and check yourself. As you arrive at any lane check for any signs that it may be quite difficult if you have any worries what so ever no matter how small walk the route first. You can drive along the good bits and get out and walk the worrying bits but REVERSING IS NOT EASY! in some situations reversing can be dangerous or you may have to reverse for miles! be sure to look for turning areas along the route should you need to do a 3 point turn to get out being aware of any ditches! Ensure you don’t trespass on any land to turn around that’s not part of the highway. If you see any signs stating “Unsuitable for motors” it is an Information sign only it is there so any vehicle that is not able to drive the routes i.e. non 4×4’s don’t go down the routes and get stuck or have accidents. If you’ve done your council checks then ignore any private road signs they are simply put there to discourage law abiding drivers. 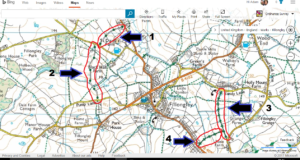 It always helps to have a GPS system with OS maps loaded like Memory Maps Because it allows you to keep on the legal route as sometimes you’ll see two seemingly sturdy lanes and you wont be sure which one is the one that’s legal! Let’s run through the scenario of your exploration : you start at the northern end of Lane 1, you’ll discover that it appears a sturdy track but it’s tight so no opportunity to turn around! So you decide to walk it, it’s better to be cautious then have an accident! You discover it’s solid through out and go back to your car flick your Dusters 4WD mode into ‘AUTO’ and drive it! Yay your first lane that was easy! You decide to cut across to lanes 3 and 4 (you can still stay in auto 4WD) as if you come back to 2 you’ll be pointing back towards home so off you go to the northern end of lane 3, you look at it and it’s very wide, you could get a HGV down there! So you tentatively decide to drive it without walking, you drive through some stunning countryside at a steady pace of approx. 5/10 mph as you reach the eastern end of Lane 4 you can see that it’s obstructed with a width prohibitive fence, people can still use it but vehicles are not, if the council have told you it’s open to all you can make a note of it and take a picture then re-contact the council at a later date. You see that the previously wide and sturdy route of Lane 3 is now becoming rather undulating with some rutting (The lines made by tire tracks that have recessed into the ground creating a raised centre) but the main road is within sight, you have a quick assessment and realise your Duster is high enough not to get grounded (Where your underbody gets stuck on the centre lifting 1 or all wheels off the ground – a serious situation that may require recovery), It’s a bit bumpy ok quite a bit bumpy but you come out the other side in one piece, wow that was stunning! so off to finish now on the last lane which is Lane 2. You approach the southern end and see that one wheel track is higher than the other but although it being relatively tight it looks generally in good condition! So you decide to drive it, as your driving along your car is tilted due to the difference in the track heights kind of scary so you look for places to turn around just in case it gets worse. You notice a field gate that you can just about do a 3 point turn, good stuff. You then come into an area that’s flooded! Oh damn… you can see the road on the other side and it looks relatively ok but how deep is this water? it’s as long as a lorry and trailer combined! if not longer, you know the Dusters wading depth is 350mm but can it go deeper? your not too sure then remembered that you saw a Duster YouTube video on this very stretch of water, You could depth test the water but that involves wellies/waders and a measure! the key point in the video is that the water is as high as the edges of the road, this is important as when that Duster went through it’s the same depth as it is now because the water is again no higher than the road, inevitably there is a risk of an object in the water or some major changes to the ground underneath but you decide to plod on, You select 4WD lock and as stated in the manual you turn off the traction control, you gently hit the water and create a bow wave and drive across the stretch of water and once on the other side you can see you can just make a 3 point turn if needed in this area. You look ahead and it’s a muddy hill with which there’s an embankment on the right which looks rather intimidating as its where the tracks go further up there’s a 90 degree bend at a worrying angle, you decide to walk the rest of the route and it looks pretty scary, you remember you’ve also seen a few videos of the Duster driving this lane and despite it looking un-drivable you could either decide, that’s enough adventure for me and turn around or continue it’s your choice and your ultimately responsible for any problems you end up having, in this case you decide to drive on as your adrenaline mounts and your car tips to a worrying state but your still in 4WD LOCK and your Traction Control is off. You start tenderly going up the hill and round the corner, as you reach the top and have done the corner you come into a tunnel of trees, it’s beautiful, a real treat, then you see the track is clearly laid out with mild rutting and you drive through the mud and puddles and pop out the other side with pride! You re-enable AUTO and turn on Traction Control as you come off the lane. You now drive up to the southern end of Lane 1 and re-drive it back to the start and head home! The adventure has been completed, safely and with appropriate checks! That’s all for this tutorial if you have an questions or comments about it please join us on Facebook or contact us!